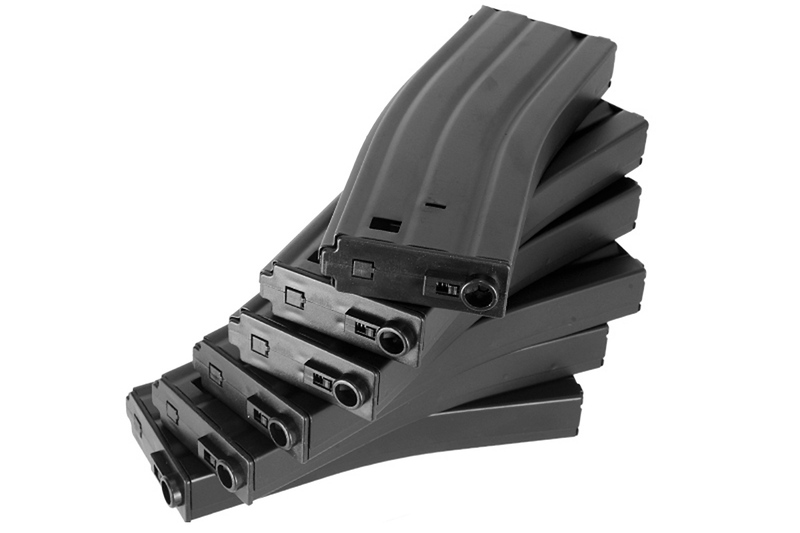 The six pack of high capacity magazines is more than enough to carry BBs out there during your airsoft match. Have some of these pre-loaded to quickly swap out when coming back and forth from a game. This magazine is recommended for use with the A&K, Tokyo Marui, Classic Army, VFC, ICS, G&G, KWA and G&P M4/M16 series AEGs, it may work with other brands AEG but cannot be guaranteed by Airsoft GI. Find the trap door, usually located on the top of the magazine near the loading nozzle. Wind the wheel at the bottom of the magazine (notice the pitch and volume of the click). Continue to wind wheel until pitch changes. Once the click gets louder, or begins to "double click," the magazine is fully wound. Insert magazine into gun and fire. You may need to rewind the wheel during play.